At the age of 91, the French organist and composer Charles-Marie Widor (1844-1937) dictated his “autobiographical memories” based upon notebooks in which he noted the most striking facts of his life. It resulted in a manuscript of 103 typed pages. Although these autobiographical memories were not completed with us in mind, their content is no less interesting for those keen on art and history. The story of Charles-Marie Widor takes the form of a fresco that leads us into the political, scientific, and artistic world of the Second French Empire and most of the French Third Republic. Known as the founder of the organ school and the author of 10 symphonies for his instrument, Widor takes on the airs of a European ambassador of French culture and individuality. The CD label Orgelkunst presents its 10th CD together with this special issue. 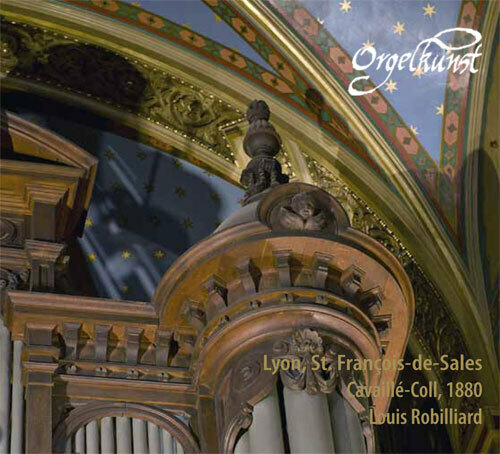 Louis Robilliard, renowned organist of the remarkably pristine Cavaillé-Coll organ from 1880 in the Saint-François-de-Sales church in Lyon, gives his interpretation of the Trois Chorals by Franck and the Andante sostenuto from the Symphonie Gothique by Charles-Marie Widor. With this CD, Orgelkunst wants to draw public awareness to the fact that a similar instrument from this French organ maker stands in the Concert Hall of the Royal Conservatory of Brussels, also from 1880. This Brussels organ however was heavily transformed in 1960, and several years thereafter became unplayable. The recording in Lyon demonstrates convincingly that the near-identical world-class instrument in the Royal Conservatory of Brussels awaits its rehabilitation. This special issue of Orgelkunst (100 pages) with many unique photographs, together with the 10th CD, is offered at the price of 17 Euro (including shipping for Belgium) or EUR 27 (including shipping across Europe) or EUR 35 (including shipping outside Europe).